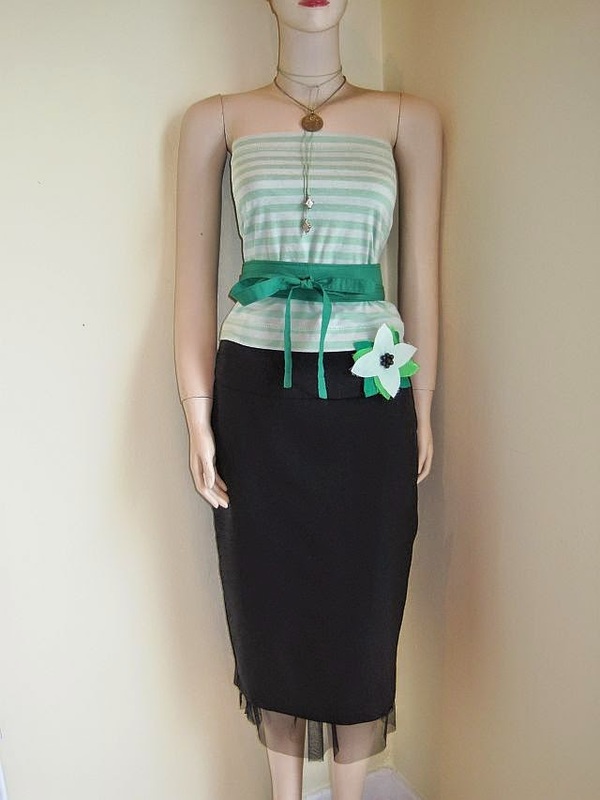 Net Underskirt, OBI Belt, Flower Brooch and Lariat Necklace. It’s time to put some of the things I have made together on my model. Starting from the bottom of the picture. First is a net underskirt. It’s so dead easy to make. Whether you make a regular skirt or a net petticoat like this, the method is the same. I am going to show some of the regular skirts I have made in future posts. Meanwhile here is a link to the instructions for the net underskirt – how to make a net petticoat. Next my model is wearing a flower brooch. I make them out of fabric scraps. Find out more about how to make them in this post – easy flower brooch. The OBI belt is one of my favorite items to make and wear. I have got them in loads of colours. I wear them with a jacket, a cardigan, a dress or a top like in the picture. See here for the instructions – how to make an obi belt. My model is also wearing a mint green waxed cotton lariat necklace with African silver beads at each end. Follow this link to find out how to make them – how to make a lariat necklace. And finally the medal necklace and the OBI belt are shown and mentioned in this older post – OBI belt and medal necklace. Only the skirt and the top that were bought new. Hey five out of seven items were home-made? That’s not too bad. If you ask me. Visit the Greenie Galleries at the top of the page to find links back to posts showing how to make your own jewlery and clothes.